One of the series of pictorial hooked rugs that describe family and romantic relationships in a droll commentary. Created by husband and wife James and Mercedes Hutchinson of New York City/Brooklyn Long Island. She designed them; then they had them hooked, and sold them through Anderson Gallery auctions in NYC in the 1940s. This one is a bit of a departure in that it has a lovely tweedy hooked background, but the woman probably represents Mrs. Hutchinson as the same woman appears in other examples of their work. The full message is in keeping with their cheery droll perspective. In excellent condition, now stretcher mounted for easy display. James and Mercedes Hutchinson were creators of a series of hooked rugs that depicted themselves and family and friends as characters in droll witty pictorial narrative rugs that today are found in major museums and private collections. The Hutchinsons lived in Shelter Island and elsewhere in the NYC area. An artist, she designed the rugs which they commissioned others to hook for subsequent sale at auction in NYC during the 1940s. 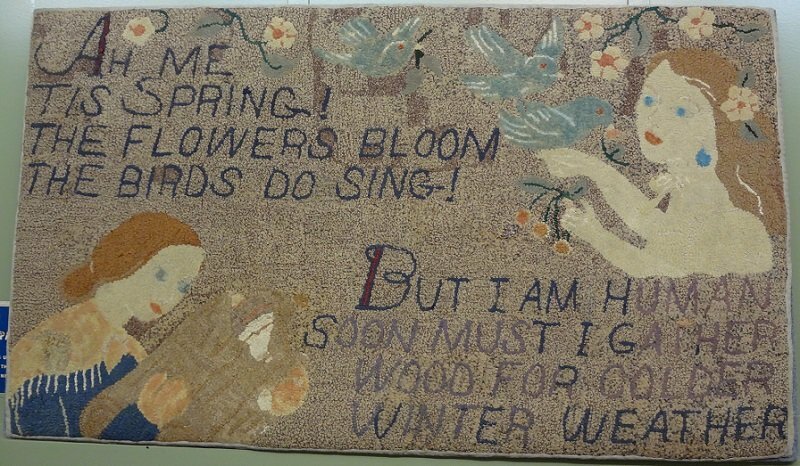 This example demonstrates the wry perspective they had on life situations and on personal interactions that they chose to depict in their unique rugs: AH ME TIS SPRING THE FLOWERS BLOOM..etc. ; the second half of the 'sentiment' is the voice of reality intruding, like their ironic messages in their other motto rugs. Ask about the several other Hutchinson motto rugs now in our inventory. One just sold (August 2015) at auction in ME for $ 14,000, a record I think for their work.